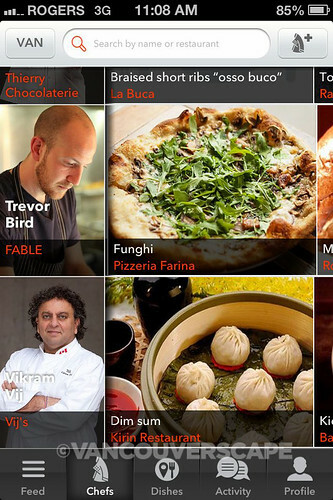 Garnering both a 2013 Webby Award and an iTunes Best Apps of 2012 shout-out, Chefs Feed is the first and only chef-powered restaurant guide. 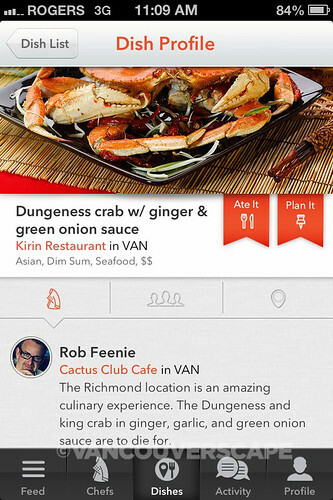 Want to know where Rob Feenie heads for his Dungeness crab fix? Where Angus An goes for sushi? 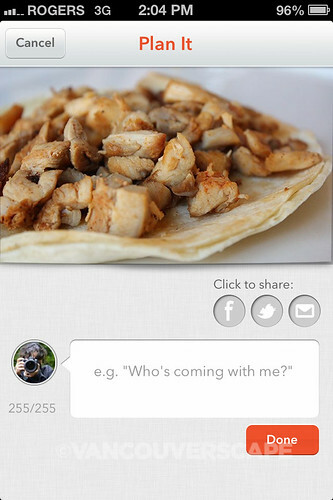 What Nico Schuermans looks for in an authentic taco? 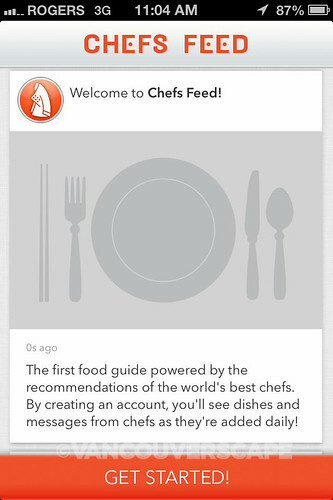 Chefs Feed has the answers. Available in 21 cities (and counting), this dynamic new app by San Francisco-based Chefs Feed gives you access to the nation’s top chefs and their locals-only dining secrets. 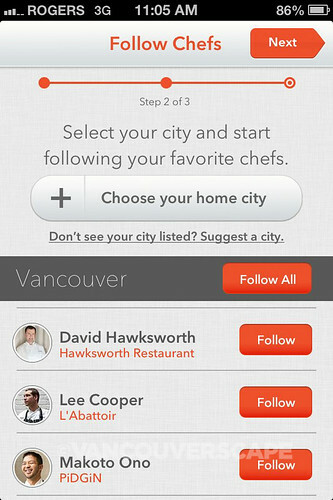 The result is thousands of dish recommendations from restaurants across the USA, and as of this writing, Vancouver is the first Canadian city to be added the list! 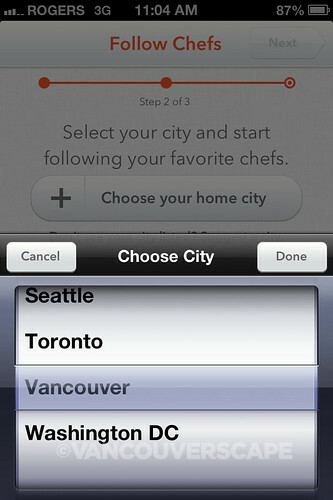 Once you choose your city, you then choose which local chefs to follow (there’s an option to follow all). 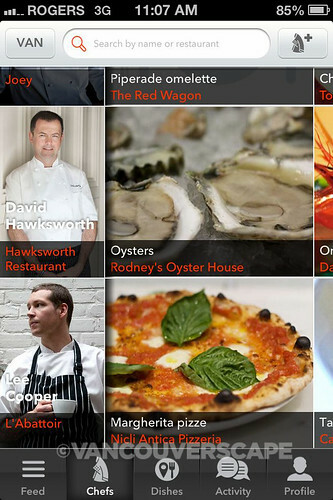 If you sign up for Chefs Feed using Facebook, you’ll also see a list of friends also using the app, with a choice to follow one or all of them as well. The Distance feature shows dishes, name of restaurant where the dish is available, whether or not they’re open (if you’ve chosen to localize the app), price range, and distance from your current location. Clicking on the dish will bring up the chef who recommended it along with a short bio and reason for the choice. 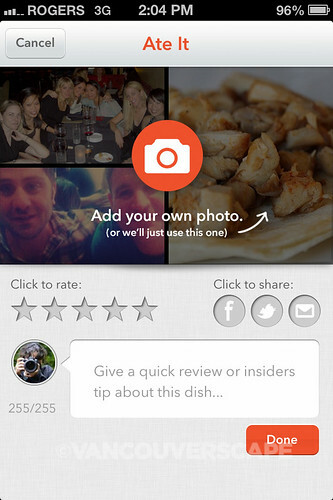 The middle icon in the Dish Profile will bring up folks who’ve tried the dish, a star rating, and their thoughts. 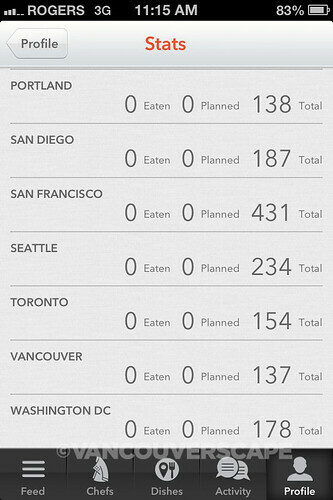 App users can also select the Ate It or Plan It pins to keep track of if/when they’ve had the chance to experience the particular dish. 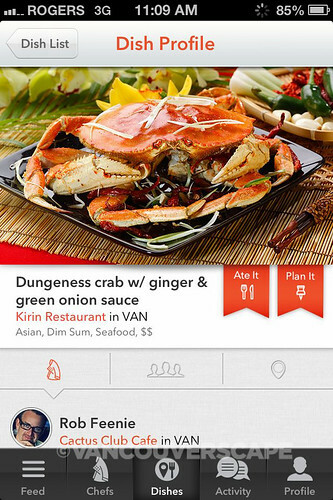 Clicking on a map will bring up the Maps App to give a more detailed location map of the restaurant’s location. 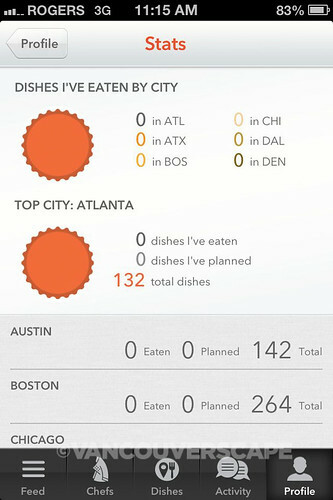 Deeper into the app, a Stats area will let you keep track of dishes you’ve tried, broken down by city. 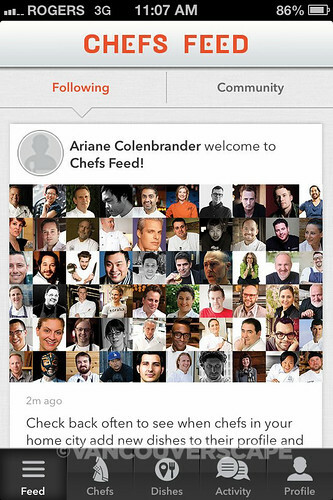 Socializing is a large part of many current apps and Chefs Feed is no different. You can select Activity at the bottom of the screen to find more friends to follow, edit your own profile, and post a Facebook update to your followers. If you’re excited about travelling to other cities for culinary fixes, there’s a range of cities available to choose from! The free iPhone app is compatible with iPhone 3GS, iPhone 4, iPhone 4S, iPhone 5, iPod touch (3rd generation), iPod touch (4th generation), iPod touch (5th generation) and iPad, requires iOS 6.0 or later, and is optimized for iPhone 5. I’ll be trying out some of our local chef’s recommendations soon and I’m certain more Vancouver foodies will add to the story.